Dota 2 is a highly successful free to play game of the multiplayer online battle arena (MOBA) genre developed and published by Valve. As with most MOBA games, 10 players are divided into 2 teams of 5, with each team defending their base separated at corners of the map, while attacking the other team’s base at the same time. Each player controls his/her own hero with its own unique abilities and style of play. The win condition is to destroy the opponent team’s ancient, located at their base. Based off the widely popular community-created mod DotA (played on Warcraft III), this stand-alone game boasts 81 of the top 100 highest-earning eSports players (money earned from prize pools in competitions) and is famous for its steep learning curve and extremely high skill cap. The aesthetics style followed closely to that in the original DotA mod, where the 2 factions were Sentinel (Protectors of nature, druids, elfs with forest as backdrop) and Scourge (undead, with blight everywhere they go). The art style was described to be more realistic and dark compared to other popular MOBAs like League of Legends. As each hero has their own unique abilities, each ability needs to have a unique look to it as well so that players can differentiate between the many abilities that are casted during the chaos of the game. Valve even takes it further by making the sound effect of every single ability different (easily up to 400-500 different abilities), so much so that there are mini games where many players can name the ability simply by listening to the sound effect. Numerous voice actors and actresses are also hired to voice the heroes in major languages like English and Chinese to make the game more immersive for its players. While each hero has its own background story and Valve has also hinted at main storylines (we call them lore) in the Dota universe, much less emphasis is placed on the story of the game compared to the mechanics and the balance of the game. Valve does release its own occasional comic series when new events and heroes are introduced to add more story to the game. The heroes themselves come from various origins. There are heroes from Greek mythology like Zeus and Medusa and also from Chinese mythology like the Sage Monkey King (Sun Wu Kong, Journey to the West). There are almost too many mechanics to be able to write about them in a single post. Largely speaking, every hero has a health pool and a mana pool. Mana from its mana pool is used when casting its abilities, and the hero dies when its health pool reaches zero. The player whose hero dies will have his gold deducted, while players who participate in killing a hero obtains extra gold and experience. Gaining a certain amount of experience causes the hero to level up, obtaining skill points to enhance or learn new abilities. Gold earned can be used to buy items, strengthening your hero or giving it useful abilities to use, aiding them in their quest to destroy their opponent’s base. 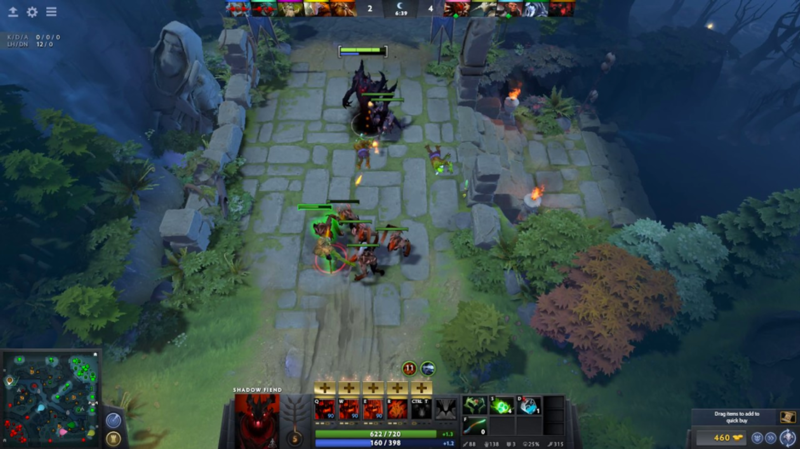 Dota 2 has been ported to Valve’s new Source 2 engine with a new in-house physics engine named Rubikon. The source 2 engine is free to use for developers, with support for the Vulkan graphical API. Dota 2 is without a doubt one of the most challenging games out in the market with this level of popularity. While Valve has tried to make an in-game tutorial for absolute beginners, it has been criticized for being inadequate and seen as not of importance to Valve. The Dota community has thus become the provider of tutorials and knowledge, from having detailed wiki pages of all skills, mechanics, interactions, to numerous Youtube channels teaching people how to play the game at various skill levels, to professional players streaming their games on Twitch.tv, showing how they play and explaining why they do certain actions. Nonetheless, the steep learning curve (a player has to at least know all 112 heroes and what each of their 4 or more abilities do in order to know what’s happening) and often toxic community (towards beginners and people who make mistakes) meant that new players mostly turn away from the game after a few tries. Unless the player really enjoys the game and has the perseverance of learning the basics of the game, or has someone patient enough to teach them, it seems highly unlikely that they will continue. This has proven true for Dota 2, as the growth rate of the game has stagnated for a long time, with players of the genre turning to less punishing and more beginner friendly alternatives. As for the matching of players within the game, Dota 2 has an algorithm in place to match players of similar skill level. The method to determine a player’s skill level is similar to the Elo rating system, a method for calculating the relative skill levels of players in zero-sum games such as chess. Basically, the more games you win, the more your rating improves, and you get matched to players with higher ratings, giving you more skilled opponents to play against. According to “A deck of lenses”, games that rely on skill tends to be more serious than games that rely on chance. This is certainly true for Dota 2. While there are many players who play the game casually, most players treat the game seriously, up to the point where they start blaming and scolding both their teammates and their opponents when things do not go their way. Stories where friends fall out because of events that happen in game are not uncommon. Personally, I feel that the level of frustration that the game brings to people can show the best and the worst in individuals, revealing a side of them that even really close friends might not have seen before. Previously, there were many elements of the game where the effects of the abilities happen randomly (eg. 25% chance of dealing more damage). However, the trend in recent years is to reduce the reliance on such mechanics by either replacing such skills, or using a pseudo-random distribution (PRD). PRD refers to a statistical mechanic of how certain probability-based items and abilities work. In this implementation the event’s chance increases every time it does not occur, but is lower in the first place as compensation. This results in the effects occurring more consistently. This has indeed resulted in more reliance on skill and allowing players to feel more in control. In a MOBA game like Dota 2, teamwork and communication can be considered one of the most important aspect of the game. Valve has done a pretty good job in this aspect. Since players can play both in a party with friends, as well as with strangers (possibly speaking different languages), communication must be universal and easily understood. Besides enabling voice chat to players of the same team, Valve has also introduced additional ways of notifying your team your intentions, via what we call the ping wheel. This can convey messages such as “Attack”, “Retreat” or “Enemy Vision nearby” at certain locations on the map. The video below shows the ping wheel in game. Players of a team are usually divided into 2 roles, “Cores” and “Supports”. Cores are deemed to have higher farm priority, which means that they are given more opportunities at accruing gold at the early stages of the game, while the Supports should be protecting their Cores while gank-ing up on the opponent team’s Cores at the same time, allowing their team to gain an overall advantage. Some heroes have better skill synergy than others. However, most of it still comes down to the players’ execution and timing of their skills. Done correctly, and the synergy can be game-winning. However, if teamwork is lacking, then even heroes that work well theoretically can lose games easily. With over a hundred heroes and close to half a thousand of different abilities, the number of interactions between skills is massive. Debugging itself is a chore, balancing the game is definitely a great challenge. This is where the players come in. As a competitive video game with the most money in its prize pools, the professional scene becomes very active. Competitions happen all year round with top teams participating in many of them. The heroes most often picked during these competitions form what we call the “meta”. With every major patch, heroes in the meta gets nerfed a little while heroes that gets rarely picked are buffed, thus circulating the pool of heroes in meta. Compared to other similar MOBA games, Dota 2 has been praised for having a much larger pool of heroes in meta, with 95.5% of the hero pool picked in its last major competition (The International 2017). The most popular pick, Earthshaker, appeared in less than half of the games, with a pick rate of 36.98%. In conclusion, Dota 2 is a game that I find myself coming back to again and again, be it to have an entertaining time with friends, or for personal enjoyment and a sense of achievement when I win an especially tough game. It is definitely one of my favourite game of all time and one that I hope survives for a very long time. This entry was posted in 2017/18 Semester 2 by limkiat. Bookmark the permalink.